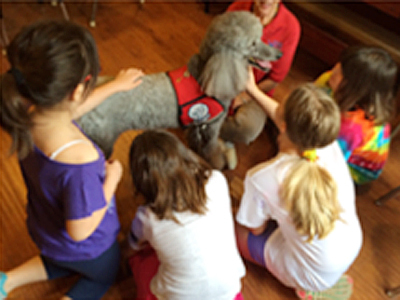 A therapy dog is a dog that has been specially trained to provide comfort and affection to people of all ages in a wide variety of situations. Therapy dogs come in all sizes and breeds. Their most important characteristic is a patient, friendly, gentle temperament that allows them to interact well and non-aggressively. Other types of animals have also been known to serve a therapeutic function when they possess those traits. 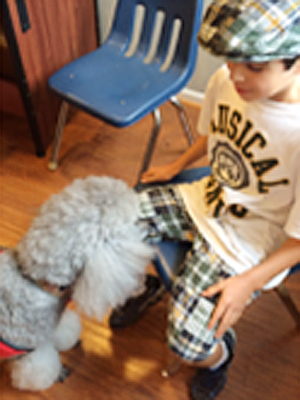 Children respond well to therapy dogs when supervised by a caring adult. 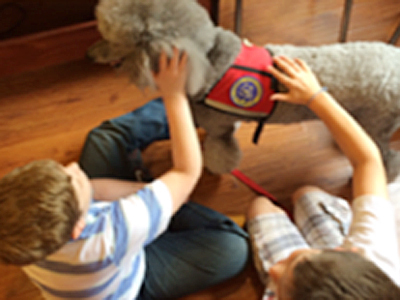 Therapy dogs have been used effectively with children who are hospitalized, autistic, or coping with loss or trauma. Even college students have used therapy dogs to cope with the stress of exams Information about local and national organizations that provide training and services is readily available on the internet. A dog doesn’t need to be a certified therapy dog to change an owner’s life for the better. Household pets of all sizes, shapes and ancestry often transform people in wonderful ways. Read how two Standard Poodles take an old woman and a teenage boy to Best in Show at Westminster Kennel Club and change their lives forever in the novel ALMOST PERFECT. I was thrilled to be a guest on “The Doggy Dish” on Pet Life Radio! Please click the graphic above to listen to my appearance, where we discussed our work with therapy dogs at The New School at the Heights, my novel ALMOST PERFECT, and even shared a few holiday recipes! I was the co-founder and Executive Director of The New School In The Heights, whose mission was to provide an alternative educational experience for children with good or superior intelligence whose social-emotional delays interfere with success in school and life. As you’ll see below, we also frequently incorporated therapy pets! 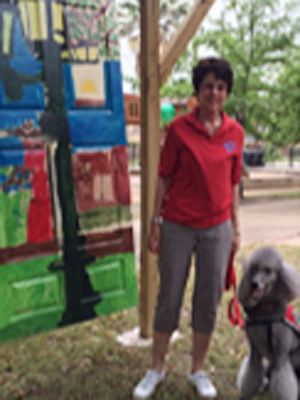 KHOU’s GREAT DAY HOUSTON aired the following feature “Student’s Best Friend.” As they put it, “The New School in the Heights has special teachers’ aids whose ‘faithful paws’ are leaving their footprint on a group of students.” We hope you enjoy the segment below! 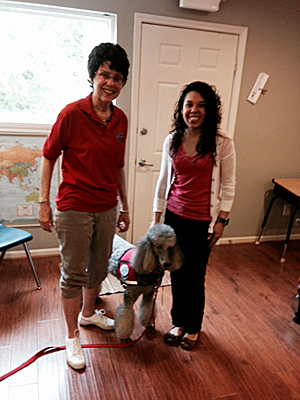 Dolly, a certified therapeutic Standard Poodle, visited the New School in the Heights for an introductory session. 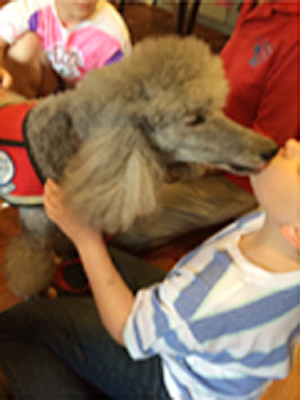 Dolly loves serving the community and usually visits adults and children in the hospital. This was Dolly’s first time serving at NSH, and she was a natural at iterating with the students and showing them affection and patience. A number of students who came to The New School in the Heights with a diagnosis of ADHD soon shed many of the symptoms that led to that label. We think this is because the symptoms for ADHD and anxiety overlap considerably. When students are placed in a calm, caring school environment with well-trained, patient teachers, the results can be impressive. One of The New School in the Height’s features that contributed to a calm, productive learning environment was ungraded classrooms. No signs appeared on doors (or elsewhere) announcing a classroom was a particular grade level. If Johnny repeated kindergarten and is a bit older than his peers, he suffers no humiliation from being “held back.” He was given work at whatever his actual achievement level happens to be. A student could be eight years-old chronologically and doing second grade math and fourth grade reading. Recently, a study conducted by the Harvard School of Public Health and the University of Iceland gave support to The New School in the Heights’ anecdotal experience. (See Harvard Public Health, Spring, 2013, page 5 or visit HSPH.HARVARD.EDU). Of nearly 12,000 Icelandic students ages 9 to 12, the youngest one-third in their classes were more likely to be diagnosed as ADHD and prescribed medications. Ungraded classes with flexible work levels that reduce anxiety and stress may provide a partial solution for these late-birthday children. Perhaps other students such as those born prematurely may benefit similarly.